My wife absolutely LOVES Rice Pilaf. And it’s SO full of flavor compared to steamed rice or white sticky rice. But it’s also usually fried in fat, oil. or butter. That’s the distinction of Rice Pilaf. 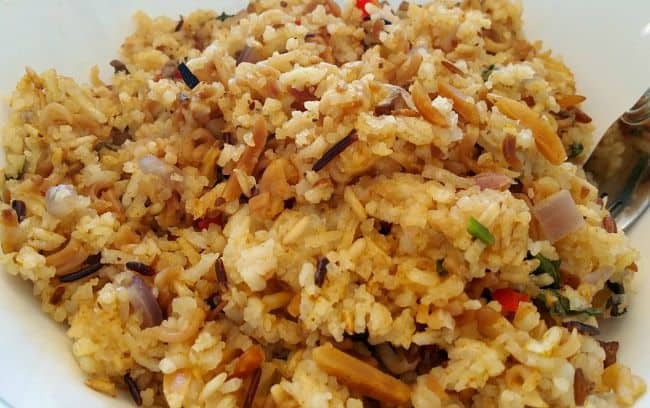 The dried rice is usually toasted first in oil and then simmered slowly in some kind of flavored broth. Well we can do the same thing without using any fat or oil at all. And the results? Seriously this is by far the BEST rice dish I have made yet. And it’s so EASY too. You’re really going to like this. You’re going to need some noodles. Any type of spaghetti noodle will do. You could use vermicelli, or orzo – those little rice like kinds of pasta, but I think Angel Hair would be the easiest to find and use. Just break them up into small inch long pieces. You’ll want about a cup. I DID have Top Ramen in here as the pasta to use….. BUT…. those little bricks of noodles are deep fried in fat. I had no idea. I always thought it was just those little packets of MSG that were so bad for you. WRONG. Forget the Top Ramen. Too much saturated fat. Use another kind of pasta – anything that’s obviously not pre-fried. 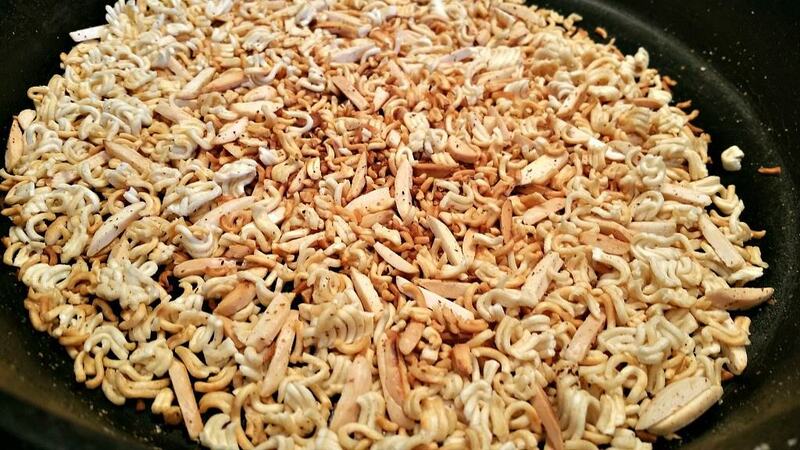 Now add your pasta and about 1/4 cup of slivered almonds to a DRY skillet and with medium-low heat we want to toast this to a nice shade of golden brown. Keep stirring as once it starts browning it doesn’t take long to burn. Note: I just made the Almonds optional as they do add some fat. I think they add that ‘rice a roni’ type texture and flavor to the dish but if you’re watching the pounds – might want to leave them out. A 1/4 cup of slivered almonds will add about 13 grams of fat to the entire dish, so about 1.5 grams per serving). Once it’s nice and toasty, add this to a large pasta pan and let’s chop some veggies. 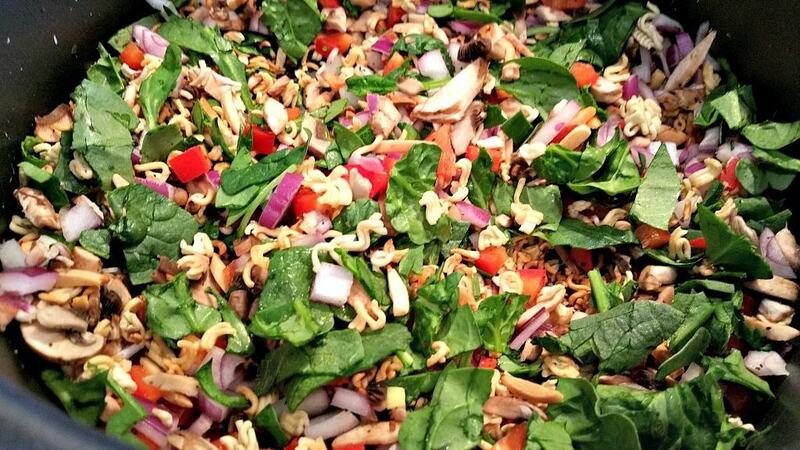 I used about 1/2 a red onion, 4-5 large mushrooms, a clove of garlic, 1/2 a red bell pepper, and a handful of fresh spinach. Traditionally, you could also add some carrots or peas but since I’m making this for the wife, peas are out of the question. It’s a texture thing. Strange but true. Anyway, you could really use almost any veggie you have on hand, but the onion is a must. Whatever you use, be sure and chop them up finely to a uniform size. Using the Red Bell Pepper and the Green Spinach, I had a nice variety of colors while adding some extra flavor and nutrition. I usually love my spices but I didn’t go crazy here as each of us have different tastes. Again, traditionally with a pilaf, people will add cinnamon, or allspice, or even cumin, but I thought it was just fine as it. But feel free to spice it up as you wish. Remember the idea here behind the spices is fragrance, rather than taste. So no more than 1/2 teaspoon total for each cup of rice. I did add some low sodium Soy Sauce to my water later, and that was all the spice I needed. Add all your chopped veggies (and spices if using) to your pasta pan and let’s move on to the rice. For this dish, I used 2 cups of rice. One and a half cups were a Jasmine White Rice, 1/4 cup Wild Rice, and 1/4 cup Brown Rice. You can mix it up however you see fit, but I think a little Wild Rice is a must to give it that traditional Pilaf look. Mix all your rices (is that a word?) together and rinse thoroughly. All that starch is what makes rice so sticky and clump together so we want to remove some of it. Now add your drained rice mixture back to that skillet and let toast that as well. 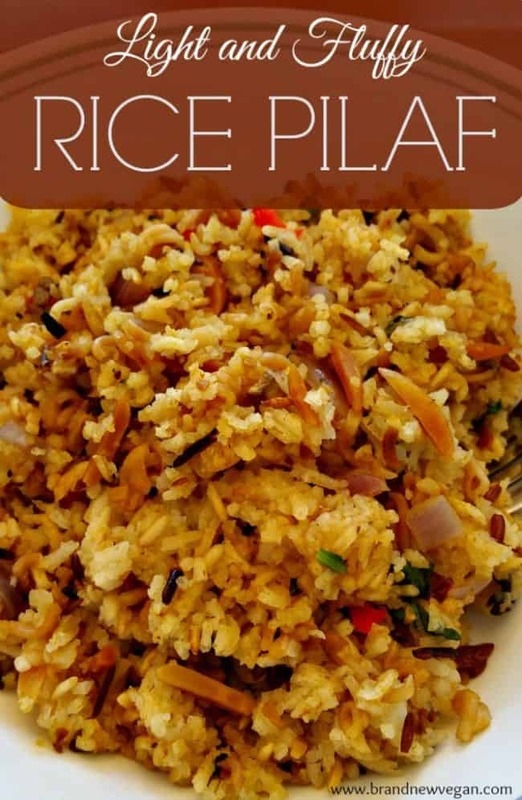 It won’t take long for the water to evaporate and you end up with a nice, dry, very loose, toasty rice. Each little grain should be separated from the rest. Toast the rice over medium-low heat until it just starts to brown a little and then carefully add it to your pasta pan. Add 3 cups of low sodium veggie broth and give everything one quick stir to combine. You can definitely substitute your own homemade veggie broth here but you want some kind of broth to give it that pilaf flavor, not just water. So use whatever you have in your pantry. Well……obviously no chicken broth or beef broth….. but you know what I mean. And finally, add about 1/4 cup of low sodium Soy Sauce to the mixture, cover it with the lid and bring it to a boil. Once it comes to a boil, reduce the heat to a simmer and set your timer for 20 minutes. Now here’s something new I learned. Once it’s done simmering, turn off the heat, remove the lid (carefully) and drape a kitchen towel over the pan and then replace the lid. We want to let this sit for an additional 5-10 minutes. The towel helps absorb all that moisture and keeps our pilaf nice and dry. The wait time also allows the rice to firm up. Fluff it up with a fork and try not to eat the whole pan like I almost did. A light and fluffy rice pilaf, with added mushrooms, onions, spinach, and bell pepper. 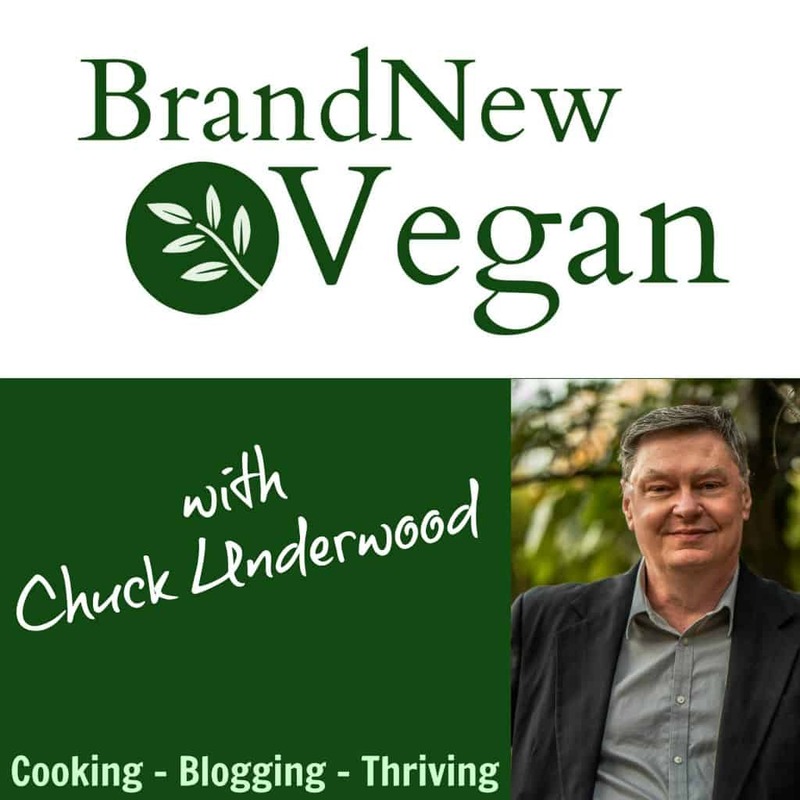 This recipe is 100% vegan, and needs no oil or butter to prepare. 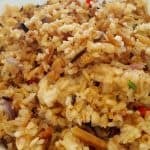 Super easy and super tasty, this will be your goto rice recipe for all those special occasions. I made this with brown rice and a bit of wild rice. It was a near disaster. Not nearly enough liquid or time to cook the brown rice. I keep trying to figure out what I did wrong, but I can’t figure it out. It just doesn’t seem like it would work with brown rice. I ended up putting it in my Instant Pot with another 2 3/4 cups water. Cooked it for 22 minutes. It was wonderful! Instant Pot for the save! I think next time I’ll just do it in the Instant Pot to start with. Hi, I am thinking of making this. My question is white rice takes 15 – 20 minutes to cook however brown rice and wild rice usually take 45 – 50 minutes. So how does it get done in the 20 minute cook time you recommend? Thanks. I just made this and it was so delicious! I used 1/2 brown rice and 1/2 wild rice and vermicelli. Loved it! I love the idea. Trying it soon. I read this and had to groan. Out of all the things you could leave out when you are watching your weight and you chose the Almonds? There is so much misconception about nuts. Please stop spreading this kind of misinformation. The noodles will make you fat long before the almonds do.